With the goal of harnessing the untapped potential of Iranian-Americans, and to build the capacity of the Iranian diaspora in effecting positive change in the U.S. and around the world, the West Asia Council has launched a series of interviews that explore the personal and professional backgrounds of prominent Iranian-Americans who have made seminal contributions to their fields of endeavour. We examine lives and journeys that have led to significant achievements in the worlds of science, technology, finance, medicine, law, the arts and numerous other endeavors. Our latest interviewee is Nariman Farvardin. 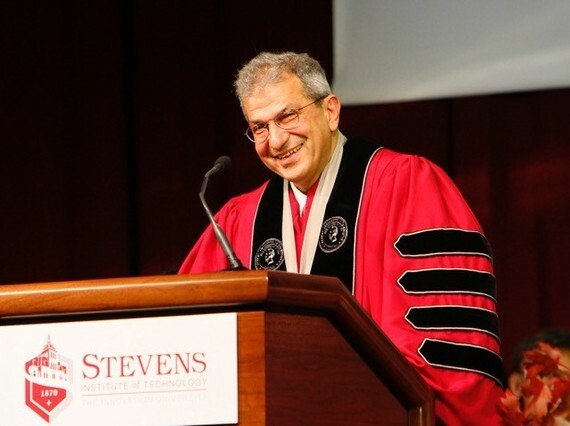 Dr. Nariman Farvardin is the seventh president of Stevens Institute of Technology since July 2011. Farvardin joined Stevens from the University of Maryland, where he was a member of the faculty for 27 years. He served as the University of Maryland's Senior Vice President for Academic Affairs and Provost from 2007-2011, having previously served as Professor of Electrical and Computer Engineering, Chair of the Department of Electrical and Computer Engineering and Dean of the A. James Clark School of Engineering. Among Farvardin's accomplishments at the University of Maryland was spearheading the development and implementation of the University of Maryland's ambitious strategic plan, Transforming Maryland: Higher Expectations. In recognition of his contributions to technology education and his support of innovation and entrepreneurship, Farvardin was featured in The Washington Post as one of the "Five to Watch" in 2003. Among his honors are the National Science Foundation's Presidential Young Investigator Award, the George Corcoran Award for Outstanding Contributions to Electrical Engineering Education, and the University of Maryland's Invention of the Year Award in Information Sciences. For more details, please click (here). Tell us where you grew up and walk us through your background. How did you decide to study engineering? I was born in Tehran, Iran in 1956. When I was two years old, my family moved to Kermanshah, a relatively small town in the Western part of the country, where I grew up. I left Kermanshah at age 17 to go back to Tehran to complete the senior year of high school and, subsequently, to attend college. There were two pivotal events that led me to become interested in a career in engineering education. First, at age nine in the third grade, my teacher asked me to tutor a classmate who was struggling with math, but whose family did not have the wherewithal to help her with third grade math nor the financial means to hire a tutor. I accepted the task with enthusiasm and some trepidation, and was successful in helping her improve her grades significantly. This was a most gratifying experience, giving me the opportunity to taste the joy of imparting knowledge to others and raising my self-confidence about my ability to teach. I continued my involvement with teaching throughout my teenage years. Second, at age 15, my uncle, who was studying engineering, gave me an electromechanical kit to build simple electrical and electromechanical gadgets. I was totally fascinated by the gadgets that I was able to put together and fell in love with electrical engineering. These two experiences, combined with a keen desire to learn and with strong encouragement from my parents, greatly influenced my decision to become a professor of engineering. I made this decision very early, when I was rather inexperienced. But, it turned out to be one of the better decisions I have made in life. Tell us about the general arc of your engineering career. What is it about engineering, research and education that feed your spirit? I was admitted to Electrical Engineering at Arya Mehr (now Sharif) University of Technology in Tehran. Being interested in electronics, computers and communications since the very beginning, I focused my energy on taking more courses and labs in these areas. When I transferred to Rensselaer Polytechnic Institute in Troy, NY, first to complete my undergraduate education and then to pursue my graduate studies, I remained focused on communication theory. I was totally fascinated by Claude E. Shannon, the founder of information theory, and wanted to do my research in an area that was related to Shannon's seminal work on fundamental limits on encoding and transmission of information. This fascination became the driving force behind the work that I did on signal compression and encoding for my doctoral dissertation and for the research that I conducted for many years thereafter, mostly on more practical problems such as compression and encoding of imagery, video, and speech signals, and their efficient transmission over noisy communication channels, such as those in cellular wireless environments. I am a strong believer that technology is the most significant driver of our economy. Spurred by research and innovation, technological advancements have played an essential role in improving health, making life more convenient and enjoyable, creating jobs, generating wealth and improving standards of living. It is a distinct privilege that now, as the President of a major technological university, I can play an active role in creating an environment that provides opportunities for young men and women to receive a technology-focused education to fuel the economic engine of the country, contribute to solving major societal problems and make the world a better place. In this position, I have the opportunity to make a difference for society, and I cannot think of anything more gratifying. While there have been many factors that have contributed to my success, I would highlight three. First, the habit of working hard, which has been a defining part of my personality, and was instilled in me from early childhood days. This trait has helped me to compensate for many of my weaknesses. Second, a desire to excel, which has enabled me to push myself hard to achieve more, set high standards of quality in what I do, and, in many occasions, test my own limits. A lot of talented people never give themselves the opportunity to find out how high they can go and how much they can achieve. Third, a loving and supportive family that truly cared about my education, and more importantly, about my successes, helping me every step of the way. As I mentioned earlier, Claude Shannon was an inspiration. I only met him once, but I was quite familiar with his work and immensely impressed by his genius, insight and diverse interests, which covered an incredibly broad range, from information theory to digital computers, applications of Boolean algebra to electromechanical relays, juggling, and designing unicycles. You have significant prior experience in academia, having served as the University of Maryland's Senior Vice President for Academic Affairs and Provost from 2007-2011, and having previously served as Professor of Electrical and Computer Engineering, Chair of the Department of Electrical and Computer Engineering and Dean of the A. James Clark School of Engineering. You earn $625,000 annually as president of Stevens Institute of Technology. That is far less than the $1.1 million your predecessor earned. What drew you to this post? I have a very comfortable life, a fair and adequate compensation and a great job that allows me to interact with smart colleagues and terrific students in one of the best locations on the face of the planet. Financial compensation has never been the primary driver in my professional decisions. What matters the most is having a job that affords me the opportunity to make a difference, have a lasting impact and get personal gratification. I receive all of these from my current position, and I am tremendously appreciative for the opportunity. As I said before, it is a distinct privilege to be the president of a major university that my wife calls the "hidden gem on the Hudson." As the seventh president of the Stevens Institute of Technology, you have broken fund raising records.. What was the biggest factor that helped you being successful in this regard? I think the biggest factor in this success has been my ability to earn the trust of the community, especially of the alumni and donors. Trust is a key for success in any leadership position. If alumni and donors trust that you have a vision, that you are a person of integrity, that you are a good steward of the university's resources, that you put the interests of the students and the university before your own, and that you know how to convert vision into action, they tend to become very supportive and generous. This has happened at Stevens in a significant way. To read the second part of interview chick here.